One of the Western scholars to pioneer the study of the Bahāʾī faith was the noted Orientalist Edward Granville Browne (1862–1926), who met personally many of the central figures of the religious movement, including Bahāʾ-Ollāh (also Baháʾuʾlláh, born Mīrzā Ḥusayn-ʿAlī Nūrī, 1817–1892), the prophet-founder of the faith. Browne’s book, Materials for the study of the Bábí religion (1918), represents a valuable sourcebook for the early history of the religion, containing several primary sources in English translation. The ninth chapter of this book, ‘List of the descendants of Mírzá Buzurg of Núr, the Father both of Baháʾuʾlláh and of Ṣubḥ-i-Azal’, reproduces a list compiled in June 1912 by Mīrzā Ebrāhīm Khān, a grandson of Mīrzā ʿAbbās Nūrī (known as Bozorg-e Vazīr, d. 1839), the father of Bahāʾ-Ollāh. This list was sent to me in June, 1912, by the already-mentioned Azalí scribe of Iṣfahán, resident in Ṭihrán, with whom I succeeded in establishing relations, and who supplied me with numerous precious documents. The original is written, not very distinctly, by a certain Mírzá Ibráhím Khán, the son of Fáṭima Khánim, the niece of Mírzá Buzurg’s daughter (the half-sister of both Baháʾuʾlláh and Ṣubḥ-i-Azal) Sháh Sulṭán Khánim, commonly known as Ḥájji (or Ḥájjiya) Khánim-i-Buzurg. It is accompanied by a more legible transcript by the aforesaid scribe. Mírzá Buzurg seems to have had six wives (unnamed in the list) who bore him children, and who are here distinguished by Roman numbers. (2) Mírzá Ḥusayn ʿAlí Baháʾuʾlláh; (3) Mírzá Músá Kalimuʾlláh1, who followed Bahá; (4) an unnamed daughter. (5) Mírzá Muḥammad Ḥasan (Azalí). (6) Mírzá-qulí; (7) an unnamed daughter (both Baháʾís). (8) Ḥájji Mírzá Riẓá-qulí, known as Ḥakím (the Philosopher), d. A.H. 1311 (=A.D. 1893–4), aet. 90; (9) Sháh Sulṭán Khánim, commonly called Ḥájji Khánim-i-Buzurg, d. A.H. 1322 (=A.D. 1904–5), aet. 84. She wrote in 1310/1892–3 a refutation of ʿAbduʾl-Bahá (ʿAbbás Efendí) known as Risála-i-ʿAmma (“the Aunt’s Epistle”)2; (10) Mírzá Muḥammad Taqí, known as Paríshán, d. A.H. 1292 (=A.D. 1875–6), aet. 45: (11) Mírzá Ibráhim, aet. 30: (12) Fátima Khánim, still living in A.D. 1912, aet. 70. All these five were Azalís. In 1912 five of Fáṭima Khánim’s children, three daughters (Fakhriyya, Ḥamída and Zamzam) and two sons (Muḥammad Khán and Ibráhím Khán), all Azalís, were still living. Baháʾuʾlláh had two wives, each of whom bore him six children. Ṣádiq, who died at the age of 3 or 4. ʿAbbás, now known as ʿAbduʾl-Bahá, who was born in 1257/1841. He had four daughters, two of whom were married to Mírzá Hádí and Mírzá Muḥsin respectively. Bahiyya Khánim, b. 1260/1844 (unmarried). ʿAlí Muḥammad, d. aged 7 in Mázandarán. Mahdí, who died at ʿAkká 1287/1870–1. ʿAlí Muḥammad, b. and d. at Baghdád, aged 2. Muḥammad ʿAlí in 1270/1853, the rival claimant to ʿAbbás. He has three sons, Shuʿáʿuʾlláh, Amínuʾlláh and Músá. Ṣamadiyya Khánim, b. at Baghdád, d. aged 49 in 1322/1904–5. She was married to her cousin Majduʾd-Dín (son of Mírzá Músá) and had two daughters. ʿAlí Muḥammad, d. at Baghdád, aged 2. Sádhajiyya Khánim3, b. at Baghdád, d. aged 2 at Constantinople. Ẓiyáʾuʾlláh, b. at Adrianople 1282/1865, d. at Ḥayfá, aged 34, 1316/1898. He was married, but died without issue. Badíʿuʾlláh, b. at Adrianople 1285/1868. and Hádí, seem to have resided in Persia and only to have visited their father occasionally, while a third, Aḥmad, left Cyprus for Constantinople (probably with his wife Fáṭima and his four-year old daughter ʿÁdila) in 1884; and five daughters. Of the sons whom I met in Cyprus the eldest and most intelligent was ʿAbduʾl-ʿAlí4. The next, Riẓwán ʿAlí, who was for some time in the service of the late C. D. Cobham, Esq., Commissioner of Larnaca, turned Christian and took the name of “Constantine the Persian.” He died recently. Most of the Azalí MSS. in the British Museum were transcribed by him. 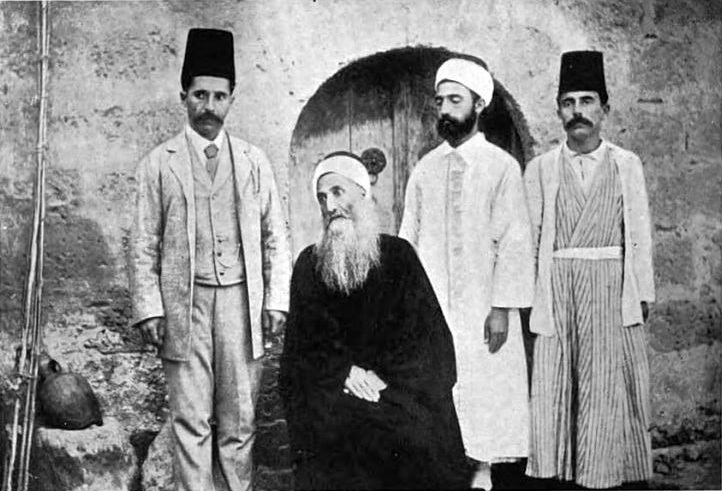 Mīrzā Yaḥyā Nūrī (known as Ṣobḥ-e Azal, 1831–1912), with three of his sons. Source: Edward Granville Browne, Materials for the study of the Bábí religion (Cambridge: Cambridge University Press, 1918), 322a.